As well as bespoke kitchens, we have an account with a leading kitchen door manufacturer. They supply standard door and drawer fronts. Revamp your old kitchen with new doors and drawers without the expense or replacement of the carcasses. Standard sizes or made to measure, we can supply and fit high quality kitchens at an affordable price. We are able to provide and install all types of appliances incorporating it at the time of fitting. 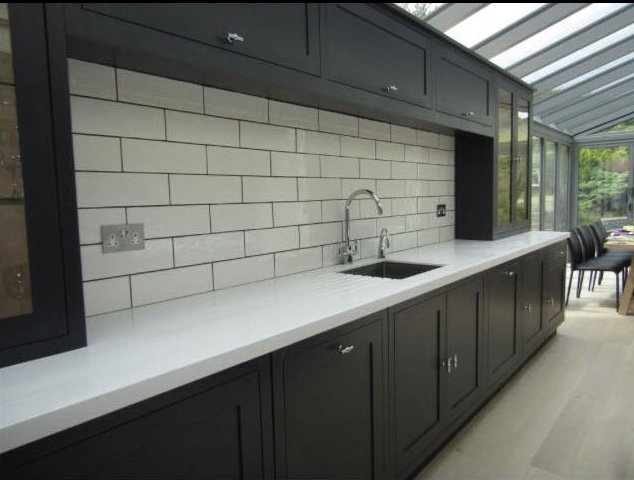 Worktops including Granite, Quartz, Beech, Oak, Iroko, or Pine, can be sourced and fitted. Tulip wood Shaker Doors can be made to any size and painted in a durable eggshell finish. Our Mirrors can be made to order, different wood or painted finish are available. Smaller items such as benches, butchers blocks and bin stores, chalk boards, coat hooks and peg racks can also be made to order. All our timber is kiln dried and treated to limit movement, however we cannot guarantee this from happening with handmade and reclaimed pieces. Oak tables can have a 4" Taper or Square Leg, with a 2" top.Reclaimed Pine farm house tables have a turned leg, with a 2"top.Table legs can be waxed or painted and drawers can be added for an additional fee.